Southern root-knot nematode Meloidogyne incognita, from the United States Department of Agriculture. 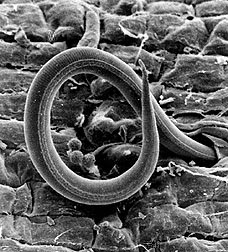 The Tylenchoidea are a group of nematodes including free-living feeders on soil fungi and algae, and parasites (both external and internal) of plant tissues. Characters (from Maggenti et al. 1987): Lip region generally hexaradiate and distinguished from general body contour. Labial region supported by a cuticularized skeleton that may or may not be well developed. Procorpus generally set off from metacorpus, usually slender and cylindrical. Isthmus narrow and leads to the expanded glandular region almost always wider than the metacorpus. Glandular region consists of three glands ending at the beginning of the intestine or variously overlapping this structure. Phasmids commonly adanal, on the tail or erratically on body. [Ge02] Gems, D. 2002. Ageing. In The Biology of Nematodes (D. L. Lee, ed.) pp. 413-455. Taylor & Francis: Florence (Kentucky). [Gi02] Gibbons, L. M. 2002. General organisation. In The Biology of Nematodes (D. L. Lee, ed.) pp. 31-59. Taylor & Francis: Florence (Kentucky). [H02] Hope, I. A. 2002. Embryology, developmental biology and the genome. In The Biology of Nematodes (D. L. Lee, ed.) pp. 121-145. Taylor & Francis: Florence (Kentucky). [J02] Justine, J.-L. 2002. Male and female gametes and fertilisation. In The Biology of Nematodes (D. L. Lee, ed.) pp. 73-119. Taylor & Francis: Florence (Kentucky). [KH02] Kerry, B. R., & W. M. Hominick. 2002. Biological control. In The Biology of Nematodes (D. L. Lee, ed.) pp. 483-509. Taylor & Francis: Florence (Kentucky). [L02a] Lee, D. L. 2002a. Cuticle, moulting and exsheathment. In The Biology of Nematodes (D. L. Lee, ed.) pp. 171-209. Taylor & Francis: Florence (Kentucky). [L02b] Lee, D. L. 2002b. Behaviour. In The Biology of Nematodes (D. L. Lee, ed.) pp. 369-387. Taylor & Francis: Florence (Kentucky). [LB02] Ley, P. de, & M. Blaxter. 2002. Systematic position and phylogeny. In The Biology of Nematodes (D. L. Lee, ed.) pp. 1-30. Taylor & Francis: Florence (Kentucky). Maggenti, A. R., M. Luc, D. J. Raski, R. Fortuner & E. Geraert. 1987. A reappraisal of Tylenchina (Nemata). 2. Classification of the suborder Tylenchina (Nemata: Diplogasteria). Revue Nématol. 10 (2): 135-142. [MM02] Munn, E. A., & P. D. Munn. 2002. Feeding and digestion. In The Biology of Nematodes (D. L. Lee, ed.) pp. 211-232. Taylor & Francis: Florence (Kentucky). [SB05] Scholl, E. H., & D. M. Bird. 2005. Resolving tylenchid evolutionary relationships through multiple gene analysis derived from EST data. Molecular Phylogenetics and Evolution 36: 536-545. [SZA-T91] Sweelam, M. E., M. A. Zaki & S. M. Abo-Taka. 1991. Efficacy of some pesticides in field control of soil mites and nematodes infesting potato plants. In Dusbábek, F. & V. Bukva (eds) Modern Acarology: Proceedings of the VIII International Congress of Acarology, held in České Budĕjovice, Czechoslovakia, 6–11 August 1990 vol. 2 pp. 713-717. SPB Academic Publishing: The Hague. [Wh02] Wharton, D. A. 2002. Nematode survival strategies. In The Biology of Nematodes (D. L. Lee, ed.) pp. 389-411. Taylor & Francis: Florence (Kentucky). [Wy02] Wyss, U. 2002. Feeding behaviour of plant-parasitic nematodes. In The Biology of Nematodes (D. L. Lee, ed.) pp. 233-259. Taylor & Francis: Florence (Kentucky).